If you are looking to surprise someone with concert tickets, the best way to keep the recipient guessing is to wrap the tickets in a mysterious way. This method is fun for both parties as you get to ultimately surprise your friend or family member and experience the joy of the recipient's reaction to the gift. Pick a basket or even a nicely decorated box, and arrange a series of favorite things for the gift recipient. Include small objects such as candy, beverages, baked goods or small collectibles. Tuck the concert tickets into the gift basket, ensuring that they are conspicuously located. Use tissue paper to take up any extra space within the basket or box. If you are using a box, select one with a lid and keep the lid closed by tying a large ribbon around the box. For a basket, use colored cellophane secured with a decorative bow to complete the look. For the music enthusiast, include concert tickets within a CD or vinyl case. 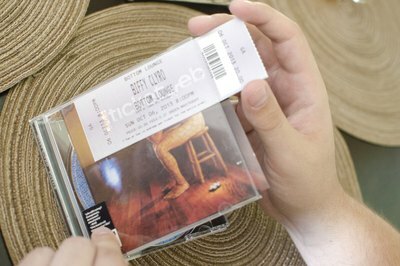 For the best presentation, replace the CD booklet with the concert tickets, or at least set them in front of it, allowing the tickets show through the CD cover. When including tickets with a record, place the tickets next to the record in the slip cover. When the gift recipient opens the record and attempts to play it, the concert tickets will slip out! Wrap the concert tickets with a gift of a similar theme. For example, purchase a t-shirt that depicts an image of the band, its logo or upcoming concert tour along with the concert tickets. Wrap the tickets within the t-shirt, or merely wrap them together in the same package. The same idea applies for similar products, such as hats, bracelets or posters, that celebrate the band or act. 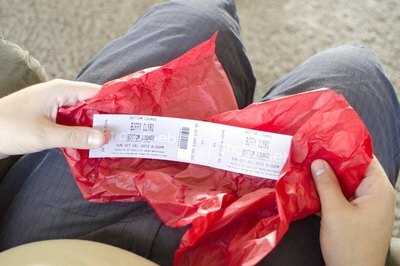 Another great way to wrap concert tickets is by using trick packaging. This can include wrapping the tickets in a ridiculously oversized box or wrapping the tickets in a series of boxes. The latter refers to wrapping the tickets in a small box, placing the small box in a medium box, and then placing the medium box within a large box. You can also wrap the tickets in a box that depicts another product. For example, wrap the tickets in a toaster box and put something else in it to give it a little bit of weight. This way, the person opening the gift believes that the object on the box is the object in the box.